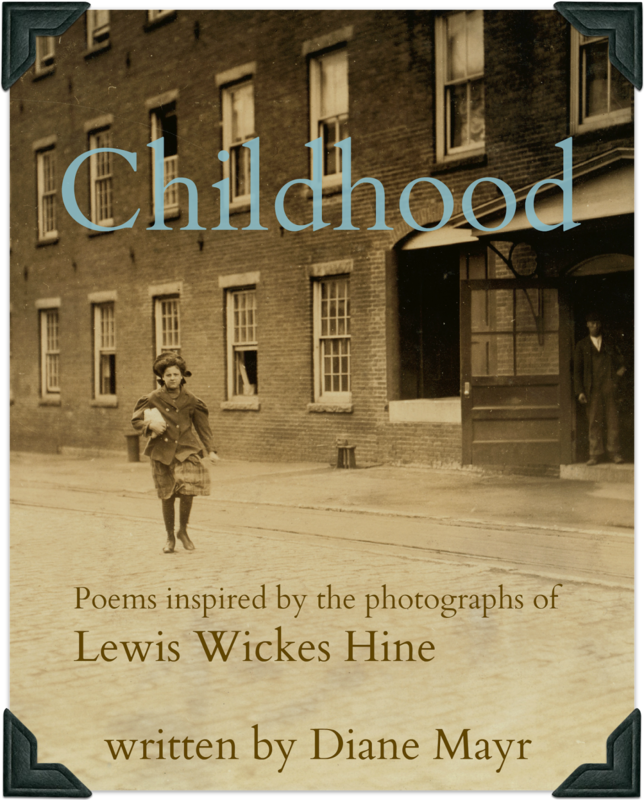 Random Noodling: Poetry Friday--The Poetry Friday Round-Up Is Here! 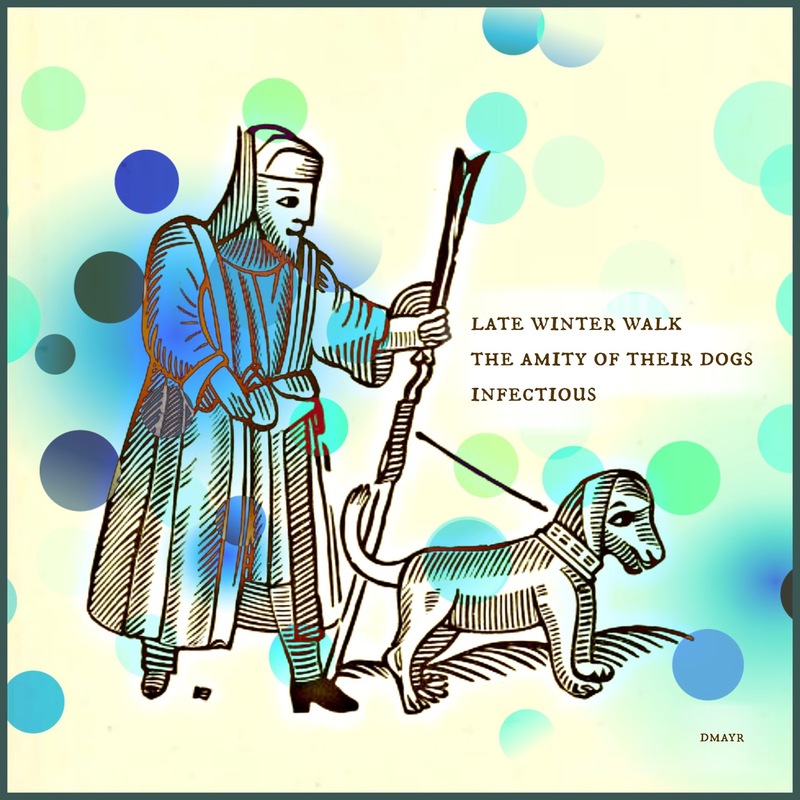 Poetry Friday--The Poetry Friday Round-Up Is Here! Photo by Lewis Wickes Hine, courtesy Library of Congress. Caption: Small family group hulling berries at Johnson's Hulling Station, Seaford, Delaware. Date: May 1910. I've got two poems completed for my entry in The Sketchbook Project, and at least two more, which I wrote prior to taking on the project. That's four down and about eleven to go! This one is especially relevant since June is the start of strawberry season! All of us are here. We gets 2 cents a quart. we take home in our fingertips! He's a real corker, he is. 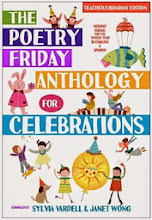 If you're here for the Poetry Friday Round-Up, leave your links in the comments and I'll be collecting them all day Friday. I'm quitting by 9:00 PM because Saturday is the Friends of the Library of Windham's annual Strawberry Festival and Book Fair, and I need my rest so that I'll have the strength to lift all those heaping spoonsful of biscuit, strawberries, and cream! 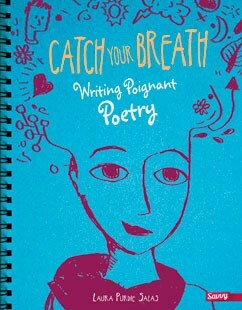 Laura Shovan showcases the poems created by kids during Laura's recent residency at Northfield Elementary. I read them and had to stop in the middle to get a snack to stop myself from drooling! Tara joins many in remembering Maya Angelou, who passed away this week. Tara shares "I Know Why the Caged Bird Sings." Angelou is now flying free, but those of us stuck on earth will miss her presence. 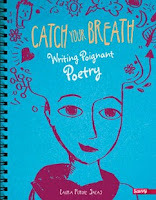 Laura Salas at Teaching Authors has a poem by one of my favorite children's poets, Valerie Worth, "Geese." I'll go post it now! This is everything that had been left in the comments prior to 11:00 PM, I'll be back in the morning to start on the rest! Good morning! I'm back and will be posting with a cat on my shoulder! It sometimes makes it difficult to type, but she's getting old and likes the nearness. How can I turn her away? Matt Forrest Esenwine's daughter had an encounter with a giant of the woods and inspired Matt's poem for today, "Problem Solved." At Beyond Literacy Link, Carol is joining us with an original Memorial Day poem, framed very nicely. She also shares a vintage postcard from her ephemera collection. I'm looking forward to seeing what other things she has in her collections! Linda at Teacher Dance has been working with student writers all year and now collects some of their work for us--poems, stories, and even an essay about the decline of whales! 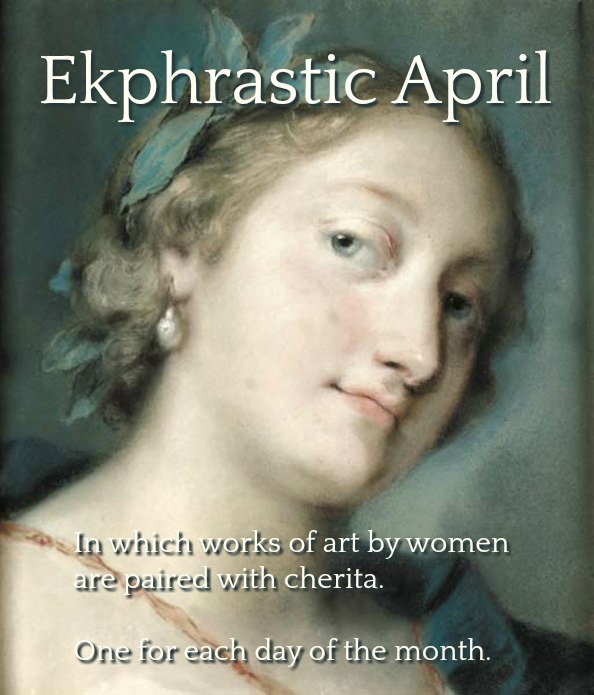 Our Amazing Days has a post about my favorite type of poetry--ekphrasis! Check out Karin's awesome poem inspired by Andy Warhol's "Grevy's Zebra." It is an amazing day! Mary Lee's Year of Reading ends the school year with "Sumer Is Icumen In." Make sure you take the time to listen to the poem sung in a round. I have "sing cuckoo" stuck in my head now. Help! Another tribute to Maya Angelou is posted by Jone. "Still I Rise" is a favorite with many. Iphigene from Gathering Books takes us in another direction with a poem by Pablo Neruda about an onion! Yes, an onion, and it's wonderful! Imagine you're in the Trojan horse. Imagine you ARE the Trojan horse. That's what Tabatha has done for us in her original poem, "Wooden Horse," we're there! At Carol's Corner the Maya Angelou tribute continues. Carol has a poem by Kevin W. Riley, which was inspired by Angelou's words. Down at The Poem Farm, Amy has an original tenting poem (also recorded for your listening enjoyment), and she shares some children's responses--art and words--to poetry. A big shout out to Heidi Mordhurst who stopped by to say she "wanted to wave at you all from under the rich, mucky surface of the Kindergarten Frog Pond.... " Hang in there, Heidi, the school year is almost over! Irene at Live Your Poem shares news of embarking on a new adventure, and, she includes her poem about Harriet Tubman called, "All Aboard the Freedom Train." Bon voyage, Irene! I almost forgot to link to KK's Kwotes! Today, there's a quote by Ntoxake Shange with a link to an article, "A Poet With Words Trapped Inside." Kurious Kitty is taking the day off at her Library blog, so there's no link. were born to adorn our hearts. Keri is recommending jumping aboard the cinquain bandwagon. She includes two cinquain that were inspired by a walk along, and a tumble into, a creek. For those who are in need today, there's an incredibly hopeful poem, "Marigolds," by Robert Graves at Bildungsroman. Karen Edmisten has been bitten by the Dickinson bug! She is fascinated by Emily Dickinson, the woman and shares a link to "Emily Dickinson" by Linda Pastan, and links to other musings on Dickinson. Trica at The Miss Rumphius Effect is back. She's been having a difficult month and so, she's posting a poem called "Sorrow." Since a shared sorrow is a sorrow halved, then by the end of the day, her readers should have her back on the joy track. At There Is No Such Thing As a God-forsaken Town, Ruth is thinking about cleaning now that the school year is over. She shares "Mother's Closet" by Maxine Scates. Project Chameleon explores the National Geographic Book of Animal Poetry and Kelly asks what poems are favorites for use in a classroom? All About the Books with Janet Squires provides us with an introduction to The Tree That Time Built: A Celebration of Nature, Science and Imagination, an anthology of poems selected by Mary Ann Hoberman. We'll close out the night with some Wendell Berry at Rogue Anthropologist. It's been a long day. Any comments that come through later tonight will be posted tomorrow. Goodnight all! Readertotz points out that Shel Silverstein's Don't Bump the Glump and Other Fantasies is now 50 years old! 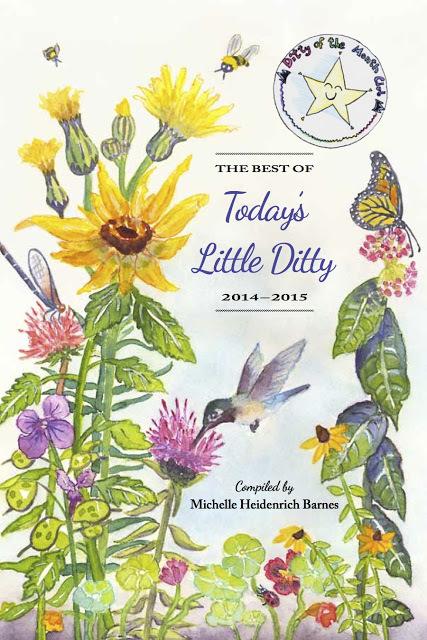 Poetry for Children's tribute to Maya Angelou focuses on Angelou's children's poetry. I'm amazed by the scope of her work! Lori Ann at On Point experiments with Superstickies (welcome to the club!) to create "Twilight's blush." 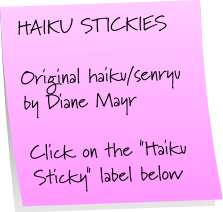 If you've never tried putting a poem on a sticky note, you can try it here. I've been a fan since 2009 and have now posted 255 weekly stickies! What a wonderful voice in your poem, Diane. Perfect last line -- I can hear the irony in your speaker's joke. 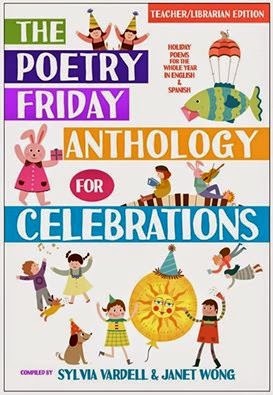 Friday is the poetry open house at Northfield ES, where I've been in residence all month. Today, I'm sharing third grade food poems: juicy tomatoes on a picnic, hamburgers, crispy duck skin, and an egg sandwich. Bring your appetite! For me, that voice is the only one that could have come from the photo. Great photo and lovely poem (wonderful final line). I'm ready for a bowl of that chili! PS--That post will be live in 20 minutes, at 10 p.m. Thursday evening CDT. Anything that features strawberries and whipped cream can't help but be fun! I, too, love the voice in your poem... though it may require more research. ;) Good thing you'll have all day Saturday to gobble up as much research as possible! The best thing about the Strawberry Festival is someone else gets to cut up the strawberries! There's no strawberries down here, either, just ones that have been trucked in. About 25 years ago, when the festival began, it took place in the second half of June and the strawberries were local. Well, that makes sense - I was wondering how you folks got them so early! I could just say that we have super weather in southern NH, but I know you know better! Diane, your linkage of a historical photo with a poem draws me into the era. The speaker's voice is loud and clear. Thank you for sharing my piece with the writing community. Sharing is what Poetry Friday is all about! 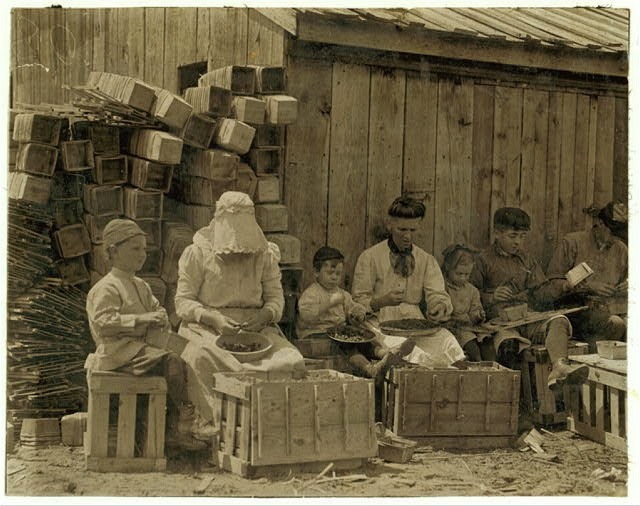 I never saw anyone make the boxes either, but other photos from that time at Johnson's operation in DE show the workers surrounded by stacks of wood. I can only assume that the wood was made into baskets on site. Here's another photo. I love the photo and your poem "Two Cents a Quart"! As others have said--wonderful voice. Also so many good words, like: "Gran and Grampy." And wow, "And You Though It Was Just Yucky" was educational! What a great topic. I did a little research on drool! We have two more days of school (thank you very much, harsh winter) but I'm still celebrating SUMER! I wish I only had two more days of work! Take some time to relax this sumer. "Ode to the Onion" is something I'd expect to find on Jama's blog! You are such a hoot, Diane-- your baby drool poem is a completely fresh take on "water"! Thanks for hosting, and for reminding me that I *must* go strawberry picking soon! I'll bet the berries in your area are ready for picking! Up here, not so much. What a perfect marriage of photograph and poem. That child has come back to life for a moment today. Thank you for hosting...Happy Poetry Friday! I'll be sending this gem both to my folks, who live very near Seaford, DE, and to my in-laws, who live in Seaford, England! What a crazy coincidence, both sets of parents come from Seaford? The East Sussex one seems so much more picturesque. I'll probably be sharing more from the project. Good morning, Dearie! I'll be with you in spirit when you're enjoying the strawberries tomorrow. I took a trip on our creek and came home with cinquain inspiration. http://kerirecommends.com/2014/05/30/poetry-friday--the-cinquain-bandwagon.aspx Thanks for hosting! Why did it take you 5 years to walk that path? I'm so glad I took the day off for do the Round-Up. The weather's gorgeous and perfect for planting flowers. Thanks so much for hosting! 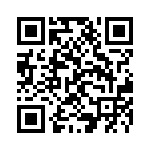 My link about Emily Dickinson is here. Please share anything else about Dickinson that you might come across. I'm back after a brief hiatus, though I've a rather depressing post. Today I'm sharing the poem Sorrow by Edna St. Vincent Millay. Thanks for hosting and for sharing the picture and your poem. Summer's coming! Dancin' in the streets! I hope I'm not too late! I have a poem by Maxine Scates today. 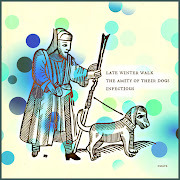 It's here: http://thereisnosuchthingasagodforsakentown.blogspot.com/2014/05/poetry-friday-cleaning-up.html. Thanks for hosting! Ruth, it's never too late! Kelly, I like the name of your blog--Project Chameleon. Hi, Diane! Though I didn't have my poetry posting act together today, I appreciate your hosting this delicious roundup. "He's a real corker, he is." - Love that! Enjoy your strawberries and books tomorrow... Mmmm, what a combo. Robyn, there's always next week! I don't think Poetry Friday is going anywhere anytime soon! Yours is the last for this evening. Thanks and goodnight! At readertotz we have Don't Bump the Glump! I knew a few people who had a grampy--I like it, it's a nice light-hearted name. I know how frustrating it is to not be able to post from the road. Typing on tiny devices with aging hands sometimes frustrates me even more! Have a great weekend. Had fun trying out Superstickies. Thanks much! At On Point I have Twilight's Blush. Have a great weekend!